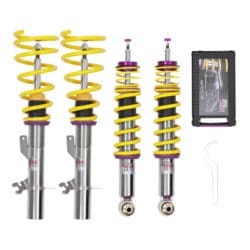 Coilovers are essentially an integrated shock and spring unit – matched perfectly together. Think of them as a strut, with a heap of upgrades. Often more expensive than an aftermarket spring and shock combo, coilovers tend to come with a much wider range of adjustment; including height, compression, rebound, camber and caster. One of the less-talked about benefits of coilovers is the fact that the spring and shock is a perfect match. When adding a lowering spring to a standard shock or strut, the spring rate, shock length and shock valving often doesn’t match. With coilovers, this isn’t an issue, providing a higher quality ride and improving the handling and cornering of your car. In this section you’ll find information on all of the major manufacturers of coilovers around the world. You can then drill down into the specific models of coilovers, comparing their specifications.